Finding Dire Dawa was pure serendipity. We were checking out Ethiopian bakeries in the Hamilton Rd. area (for our Crave feature), hoping it might be one, but as we wandered the cramped and overstocked market (no sign of baking to be found) we noticed a room off to the side. Chairs, tables, counter, samosas in the display case – it’s a restaurant alright, Dire Cafe. Once fully inside, a set of carved stools huddled around an equally ornate table captured our attention. They’re set aside for use in a traditional Ethiopian coffee ceremony. So, we thought, lets do that. First, green coffee beans are presented in a pan for inspection and whisked away to the kitchen. Shortly, they’re presented again – this time pan roasted and smoking – then back to the kitchen. Finally, the prepared coffee emerges in a large black ceramic carafe. We huddle around on the stools while the hostess assumes a central position and pours coffee into small and delicate gilded cups. The first sip reveals a dark roast with deep cardamom undertones and a thick, almost syrupy body. It’s far from what most of us consume on a daily basis, and largely better off for it. It appears that our hostess is primarily in attendance to refill our cups, and perhaps to make small talk, for as long as we see fit. There can be an element of uncertainty in such open-ended arrangements, but we needn’t have worried – after finishing the first refill we felt as though we’d consumed the contents of a Red Bull factory. Time for food. We’ve eaten Dire Cafe twice, and on the day of the coffee ceremony it was all about the lentils, lentils, lentils. With a flurry of caffeinated injera swiping, the lentils were gone. The red lentil dish, misir wat, is one of our favorites that we’ve eaten at Dire Cafe. Here it is pictured with a solid rendition of awaze tibs (beef cooked with fresh tomato berbere, peppers, onions and seasoned butter). We also really like the kuwanta firfir which is served in a basket and consists of torn up pieces of injera tossed with a sauce and small pieces of beef jerky. It’s not a pretty dish but it’s very tasty. Also popular was the yebeg tibs (pictured below) a lamb stew with tomatoes, onions peppers and garlic. Dire Cafe has a pretty extensive menu including some breakfast dishes and several dishes that are primarily comprised of raw meat. The Market also has it’s own butcher and you can see them passing freshly cut beef and lamb through a window between the butcher and the restaurant. 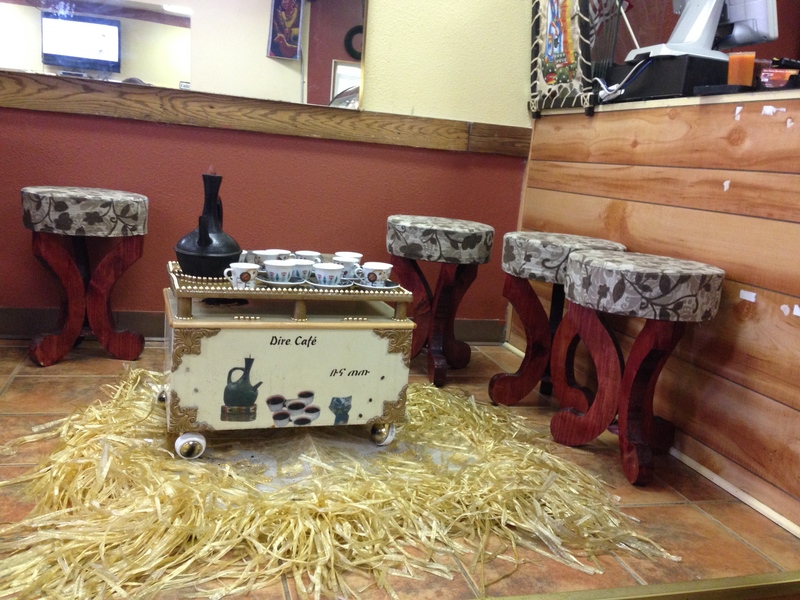 If you’re a fan of Ethiopian food or want to try the Ethiopian coffee ceremony we recommend Dire Cafe. Service is slow so be forewarned and allow plenty of time, especially for the coffee ceremony.